One of the activities that I wanted the boys to experience while we were at Disney was The Pirates League. Boys and girls (moms and dads too if they want) can transform into a Pirate or a Mermaid. There are a few different packages to choose from, ranging in price from $29.95 - $79.95 - depending on which you choose. 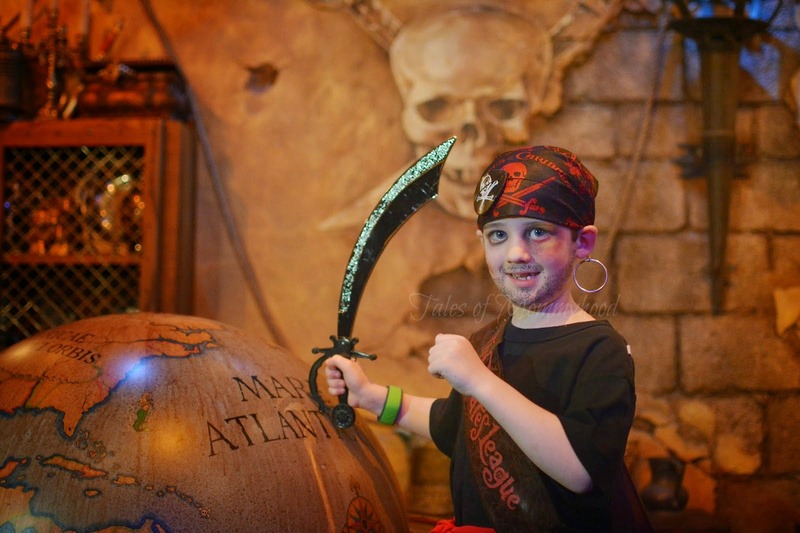 We had booked the boys in for Captain Jack (The First Mate Package) and Jake (Jake and the Neverland Pirates Package). When we arrived, Mr. K decided that he did not want to proceed. He was wearing his Jake and the Neverland Pirates Sweater, so he said that he didn't need to be Jake, he already was. We didn't force him to do it (although I was sad that he had changed his mind) and we went ahead with Mr. J. He got to spin the ship wheel 3 times, and was given the pirate name of Captain Geoffrey Shipmonk (he wasn't too fond of the name, and wanted us to call him Captain Jack instead). After he received his pirate name, Pirate Captain Stephanie called him over to the chair to be transformed. She stayed in pirate character the entire time, and was so much fun to listen to. Mr. J really enjoyed it, and when she was done Mr. J was gone and a pirate captain sat in his place. He took the pirate oath, and then we were ushered to the secret treasure room where a PhotoPass photographer was waiting to take his picture, and he was presented with a copy of the pirate oath, signed by Captain Jack Sparrow that includes his Pirate Name, Geoffrey Shipmonk at the top of the scroll! Since we had not purchased the costume to go with the experience, we didn't receive a hat. He really wanted a hat, so we went to the gift shop next to it and bought a Captain Jack hat. It's an amazing experience for the kids; I actually contemplated doing it as well, and I think next trip I will do it with them! Book in advance - although you can walk in and request an appointment, you are not guaranteed to get one. If you book in advance, you can also make an early morning appointment, allowing them to be in costume for the majority of the day! Have your camera handy, but don't worry if you don't. The PhotoPass photographer does a great job at capturing the final look! Be prepared to get stopped in the park....a lot. Pretty much everywhere we went we had people commenting on how great he looked, and asking us where to get it done. Wow! That's so cool,my sister takes her kids every year but I have never seen this, I an going to let her know, my niece and nephew would love it! What a fantastic experience! Would that be in Disneyland or Disney World in Florida? He looks really good! I can see why people were stopping to ask you where to get it done. I love how every element of Disney is awesome for kids right down to the details. Wow what a fun and interactive experience! He makes an awesome pirate!